Euro is being corrected towards level of 1.3457; right now market is moving inside the third wave of this correction and forming consolidation channel to break ascending channel and continue falling down. 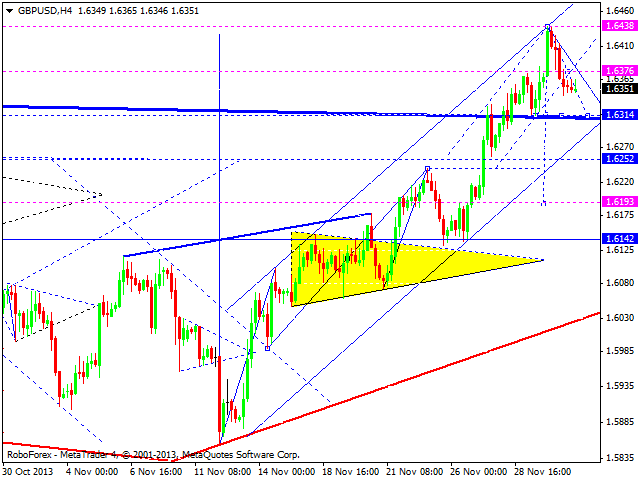 We think, today price may reach target at 1.3462 and then return to level of 1.3540 to test it from below. Later, in our opinion, pair may form the fifth descending wave towards main target of this correction. Pound formed the first descending impulse and right now is forming the second one; market is being corrected. 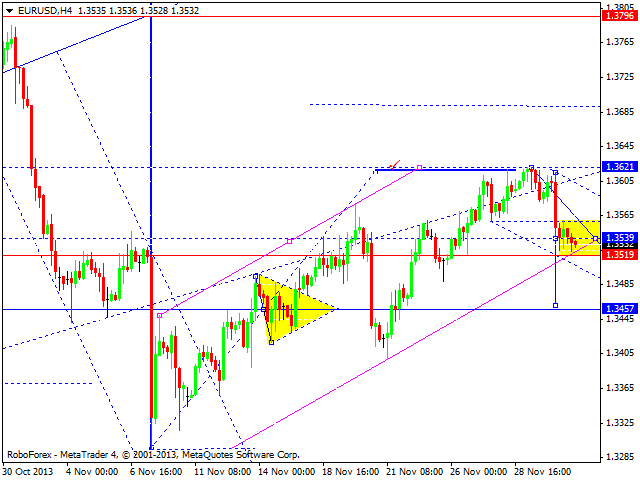 Predicted target of the second impulse is at 1.6330. Later, in our opinion, pair may grow up to test 1.6376 from below and then form the third descending impulse with target at 1.6313 to test upper border of broken triangle pattern from weekly chart. 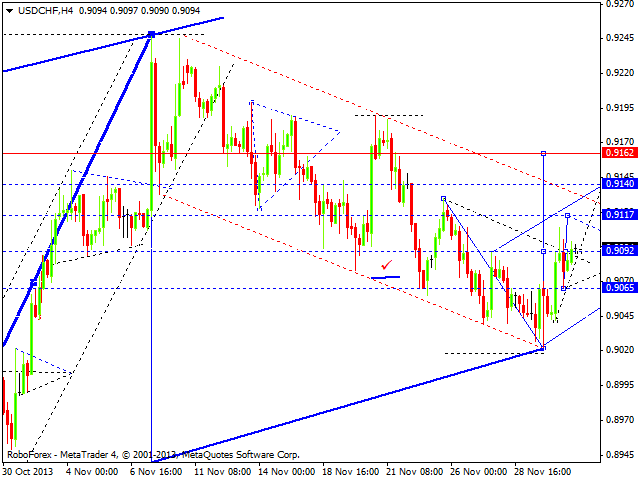 Franc continues moving upwards; market is being corrected towards level of 0.9162. Right now, pair is consolidating near 0.9092; this structure may be considered as continuation pattern of the third wave with target at 0.9140. Later, in our opinion, price may return to 0.9092 and start forming the fifth ascending wave to reach main target of this correction. Yen continues forming ascending structure. 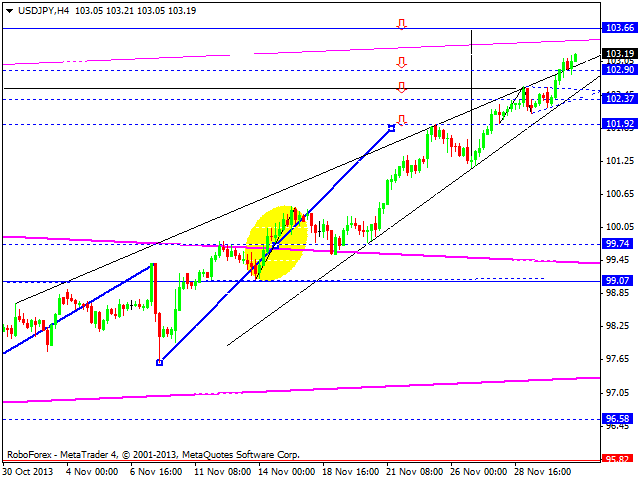 We think, today price may reach another resistance level at 103.60; it looks almost like double top pattern. Later, in our opinion, pair may start descending correction towards level of 99.70. After forming pivot point at the top, price may reverse and start falling down towards pattern’s bottom. 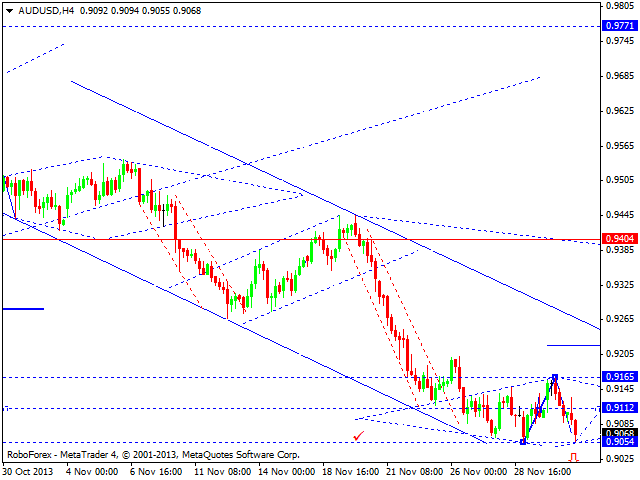 Australian Dollar is still consolidating near its minimum. We think, today price may grow up to reach level of 0.9112 and then continue moving upwards to break the top of this consolidation and start forming the fifth ascending wave. However, alternative scenario implies that price may break minimum. In this case, descending trend may continue without the fifth descending wave in the form of three-wave correctional structure. 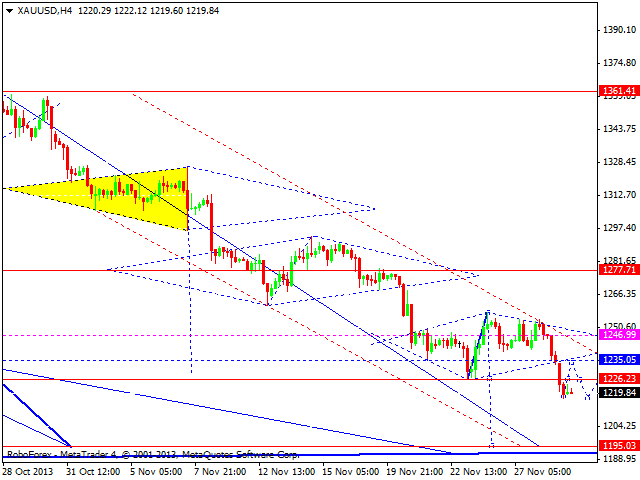 Gold broke its consolidation channel downwards and continued falling down; target is at 1195. We think, today price may consolidate at current level for a while and then continue moving downwards to reach main target of this descending wave.